The R2-D2 ANA Jet, a Boeing 787-9 Dreamliner, rolled-out from the Boeing Everett Factory for the first time this morning. 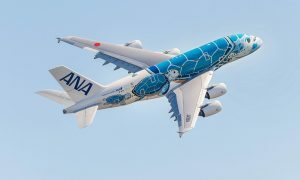 The R2-D2 ANA Jet is the first of three planes to be decorated with Star Wars characters as part of an agreement between ANA, Japan’s largest airline, and The Walt Disney Company (Japan) Ltd. The R2-D2 design was unveiled to Star Wars fans at the Star Wars Celebration in Anaheim, California earlier this year. Today marks the first time a Star Wars character appears on the exterior of an actual commercial aircraft. 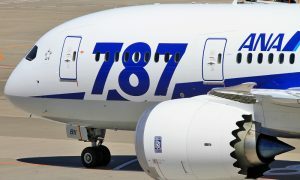 On October 18, the R2-D2 ANA Jet is scheduled to go into service on international routes, initially as flight NH116 between Tokyo and Vancouver, and then fly between Japan and other cities in ANA’s robust international network including the US (Seattle and San Jose), Europe (Munich, Paris and Brussels), Australia (Sydney), China (Beijing), and Indonesia (Jakarta). The R2-D2 motif is imprinted onto the cockpit and front half of the jet’s main fuselage, while the Star Wars logo spans the length behind the wings. The interior of the 215-seat passenger plane will feature themed in-flight decorations, such as headrest covers, paper napkins and cups, and passengers will be able to enjoy all six of the currently released Star Wars films as part of ANA’s extensive in-flight entertainment options. This will be the first time that any of the Star Wars movies have been included as part of an in-flight entertainment system. Two additional planes decorated with BB-8, a brand new character from Star Wars: The Force Awakens and R2-D2 will take to the skies following the R2-D2 ANA Jet. The first, a Boeing 767-300, will begin flying domestic Japanese routes in November and then, in March 2016, a Boeing 777-300ER, is scheduled to start serving international routes principally between Japan and North America (the exact routes have yet to be announced). Today’s ceremony began with an introduction from Ihssane Mounir, Senior Vice President of Northeast Asia Sales and Marketing at Boeing, who welcomed the crowd that included journalists, R2-D2, C-3PO and Stormtroopers. When the official Star Wars music began to play, the Paint Hangar doors at the Boeing Everett Factory opened, unveiling the R2-D2 ANA Jet to the world for the first time.